News: This is the day that the Lord hath made, we will rejoice and be glad in it! We know Christians are suffering persecution in many parts of the world, but they rarely make the main media. I have just been reading in the Evangelical Times of US Evangelical Pastor Andrew Brunson, imprisoned in a Turkish jail. severely disabled. He is aged over 70, but won't retire until his health prevents his continuing or there is someone to replace him. His main ministry is to refugees from central African where there are many wars, ethnic cleansing and religious persecution. There is a refugee centre nearby where most of his small congregation live. General / Should we remember the Reformation? Many Baptists say we should remember the reformation, others say we should not. Our friend a Baptist minister in Wick, Scotland, was preaching in our church last Lord's Day. He mentioned Luther discovering the doctrine of justification by faith, and then gave a powerful gospel message in the evening on Justification by Faith. He has invited all the ministers in the town of Wick, to come to a discussion on the Reformation this evening. We have a friend who is a missionary in Manila, Philippines. He and his Filipino wife came to Scotland to have their daughter's adoption recognized in the UK. He was offered three possible temporary pastorates by Grace Baptist Mission but when he arrived two had already called pastors which left the third, Wick. Wick is about as far north in mainland Scotland that you can get without falling into the sea. Wick was the last place he wanted to go to. It is a small mission Baptist Church with five elderly members, mainly women but they are interested in gospel outreach. In September they returned to Manila and Gilbert has asked the church there to release him to take up the pastorate in Wick. God works in a mysterious way His wonders to perform. Matthew 24 is a continuation of Matthew 23 where Jesus pronounced woe upon the scribes and pharisees. Notice that he said all the judgments for the sins of those who killed the prophets would fall on those who would fill up the sins of their fathers by murdering the sinless Son of God. Their house, the temple would be left desolate. Matt 24:2 And Jesus said unto them, See ye not all these things? verily I say unto you, There shall not be left here one stone upon another, that shall not be thrown down. 3 And as he sat upon the mount of Olives, the disciples came unto him privately, saying, Tell us, when shall these things be? A statement, a question, an answer. Agreeing perfectly with the previous judgment pronounced in Matt 23. 35 That upon you may come all the righteous blood shed upon the earth, from the blood of righteous Abel unto the blood of Zacharias son of Barachias, whom ye slew between the temple and the altar. and "36 Verily I say unto you, All these things shall come upon this generation." Europe is facing an invasion. Thousands of migrants are pouring in. 17,000 have entered Croatia in the last 36 hours. No one seems to have a solution but it seems the more that are accepted encourages more to come. Some, think we should take them all but we are an overcrowded island already. No one seems to know how to deal with the situation. Matt 24: 31 And he shall send his angels with a great sound of a trumpet, and they shall gather together his elect from the four winds, from one end of heaven to the other. What event does the above verse refer to? I cannot see how anyone can see Antichrist in that scripture. It does not mention him. The only person mentioned is Messiah the prince. Just updated my laptop to Win 10. Still trying to get the hang of it. Mark deals very briefly with the baptism and temptation of Jesus (see Matthew 3:13 to 4:11 for a more detailed account). Following his baptism, the Lord Jesus was driven by the Holy Spirit into the wilderness, where he was tempted by Satan for forty days. Though weak in body through lack of food, he did not yield to the enticements of the devil. John baptized those who had repented of their sin (4). Why then did the Lord Jesus submit to baptism when he is sinless and has no need to repent? •Baptism speaks of identification. When a believer is baptized, he is identified with Jesus in his death and resurrection (Romans 6:3–4). The sinless Lord Jesus took human flesh to identify himself with sinful mankind, being born under the law (Galatians 4:4). The law of God curses and condemns the sinner. Our sin was laid upon Jesus who has redeemed us from the curse of the law through his death at Calvary (Isaiah 53:6; Galatians 3:10–13). God the Father punished him for our sin, making him who knew no sin to be sin for us, that we might become the righteousness of God in him (2.Corinthians 5:21). I see at the moment there are 14 guests on line. Why not resgister and come and join the discussion? Do you have favourite hymns, why not post them here. Here is one to start. and nailed them to the tree. You are so rich in mercy. that was reserved for me. for death He has defeated. appeared for all to see. a resting place for me. © Emu Music Australia Inc.
Bible Discussion / The Date of the Apocalypse. This is my second preliminary point of inquiry;(The first being on the genuiness of the book) and one on which also, I believe, the historical evidence will be found not only ready at hand, but conclusive. For the testimony of Irenreus,—Polycarp's disciple, let it be again remembered, who was himself the disciple of the apostle John,—is as express to the point in question as it is unexceptionable. in our age, towards the end of the reign of Domitian"
The attempts that have been made to get rid of this testimony, and force another meaning on Irenseus' words, by those whose Apocalyptic theories made them wish to do so, seem to me to have utterly failed. It is as clear a testimony on the point it relates to, as there can be found to any other fact in any other historian. Nor is it unsupported by other testimony.—First, Tertullian seems in no dubious manner to indicate this view of the Apocalyptic date. For in his Apology, after specifying Nero's as the first imperial persecution, and this one by the sword, (wherein, as he elsewhere says ,' Paul and Peter suffered, no mention being made of John,) he proceeds to notice Domitian's as the next persecution, and this as one in which Christians suffered by banishment, the well-known punishment inflicted on St. John. It is evident that Eusebius thus understands Tertulian ; I mean as alluding to St. John's banishment as the act of Domitian. * —Next Clement of Alexandria indirectly, but I think clearly, confirms the statement. In relating the well-known story of St. John and the robber, he peaks of it as acted out by the apostle on his return from exile in Patmos, ''after the death of the tyrant;" and represents him as at that time an infirm old man. Now " the tyrant"
of it ; but the contrary.—Thirdly, Victorinus, Bishop of Pettaw, and martyr in Diocletian's persecution, in a Commentary on the Apocalypse written towards the close of the third century, says twice over expressly, and in a part that bears no mark of interpolation, that the Apocalypse was seen by the Apostle John in the isle of Patmos, when banished thitherby the Roman Emperor Domitian.—To the same effect, fourthly, is the very important testimony of Eusebius. of similar purport in Primasius; an eminent Augustinian commentator on the Apocalypse, of the sixth century. In his Preface to this Commentary, he speaks of the Apocalyptic visions having been seen by St. John when banished and condemned to the mines in Patmos by the Emperor Domitian.—Other ancient testimonies of less importance might yet be added. Nero!' But of what value is this opinion, then first broached, as it would appear ?—Or again, of what that of the commentator Arethas, promulgated still two or three centuries later, to the effect that the Apocalypse was written before the destruction of Jerusalem ; an opinion contradicted indeed elsewhere in the body of his work by himself? —Alike the one and the other slept unnoticed for centuries. And, if waked up by critics of a more modern age, it has only been (as Michaelis, we have seen, confesses) from the supposed necessity of such dates, in order to any possible explanation of the Apocalyptic prophecies- It does not need that I discuss at all prominently certain points of indirect and subsidiary historical evidence, in favour of an early date, which these writers have also called in to their aid. A sufficient notice of them will be found below: and it will appear that they all, like the direct testimony just discussed, prove weak and worthless on examination. Nor will the only other evidence offered on their side, evidence internal m its character, and which has been urged of late years with great earnestness and some effect by Dr. Tilloch and others, after Sir Isaac and Bishop Newton,—be found at all better able to bear examination. 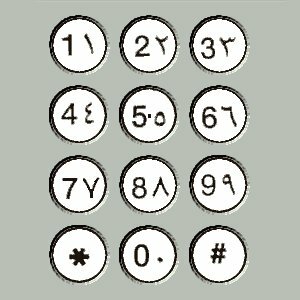 Above is link to a modern Arabic telephone keypad. What, may you ask, is the connection to the Bible? The connection is this coin. The dates are 1917 and 1335. Back in about 1890, Henry Grattan Guinness, a great interpreter of prophecy according to the Historic system, wrote a book called "Light for the Last Days." In it he interpreted the 1335 days of Daniel, to be 1335 years. He said it referred for some turning back of the Turkish Empire but he didn't know what. He died in 1910. In December 1917, Allenby marched into Jerusalem thus effectively ending the Turkish Empire. 1917 is 1335 in the Muslim calendar. I am posting this to show a scholarly attempt to record how the church through the ages interpreted the book of Revelation. The early church disagreed on many things but there were somethings which most agreed on and we should probably take heed of those as. There was a post sometime ago which said Clement believed in a future temple and I said I thought he could be referring to the church as Peter and Paul both show that the temple is the church. I also believe that Wesley referred to the same when he said "never more your temples leave." The article is quite long and the author splits it into several periods starting with John to Constantine and ending with the French Revolution to the then current year, 1862. The first edition was in 1844. I haven't as yet read all of it, but I hope to get around to if soon. Bakers guilty of 'gay cake' discrimination in N Ireland. Gay marriage is illegal in Northern Ireland.